Work on this gunstock treasure continues and I am enjoying every second of restoring this frame. I consider my role in this as that of a connector – a lucky link in a historical moment bridging a timber framer who lived centuries ago and spent months chopping, carving and erecting this beautiful hand hewn frame and the future owners who will build lives beneath these old timbers once again. Who will live amidst these timbers? What joys will happen under this roof? Children will be born and raised. Generations will come and go – with these old growth timbers standing sturdily by as silent witness. 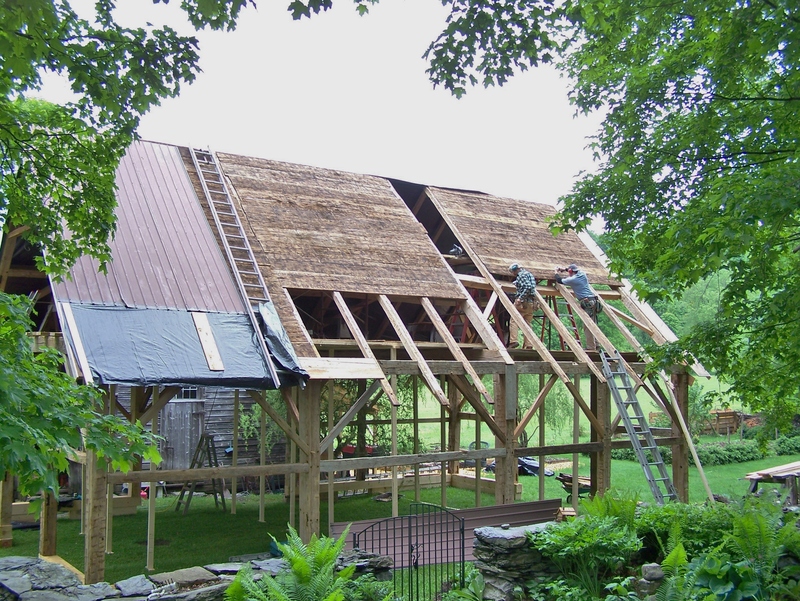 On Friday, we spent much of the day applying the original white oak roof boards back to the frame. 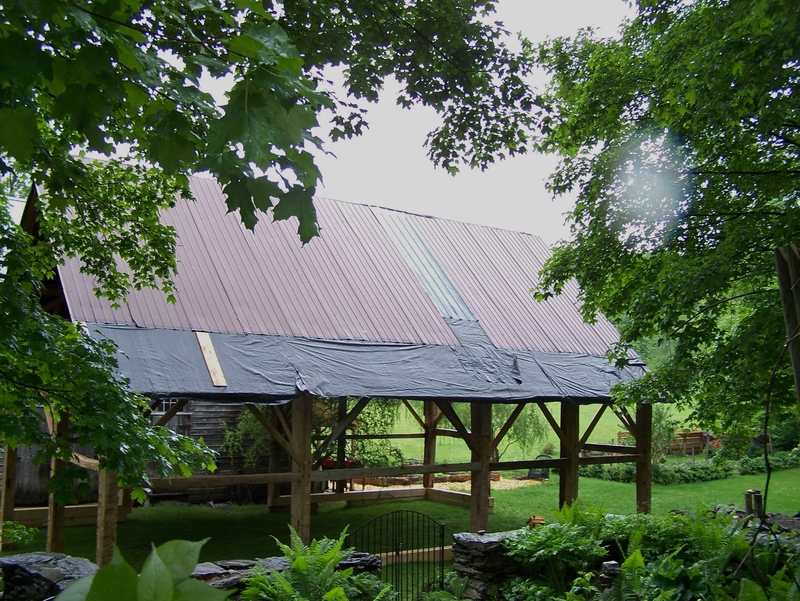 Next, we installed a roof from recycled metal (actually, it’s four roofs, over its lifetime) that had been on the barn when it was dismantled. We’re using black plastic in the interim until more metal roofing can be applied. The plastic has helped keep the frame dry during last week’s 5 inches of rain, but the metal will be more secure until we dismantling the frame in November. We will keep reusing the metal roofing on future frames as temporary rain caps until these available frames find a home. With all the rain this past week, covering the roof with plastic allowed me to sleep at night. Over the rainy weekend we headed back to the Pawlet property to take more metal roofing off of a shed (about to be torn down) that was attached to the gunstock frame. Armed with this added metal roof materials, we have all the ingredients we need to complete the roof. The photos above show the roof structure from the inside. Those large roof beams are the principal rafters. 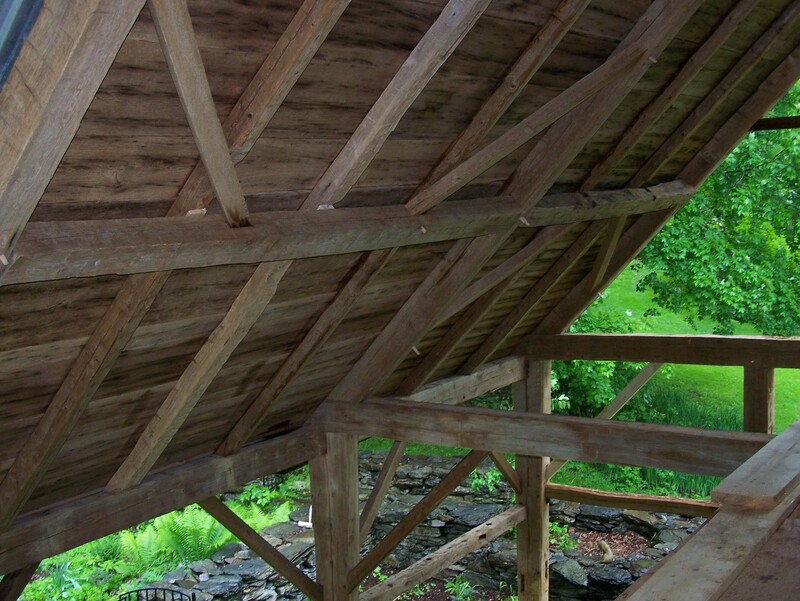 You can also see the horizontal tie beams and bracing between principal rafters. These beams support the smaller rafters which are all covered by white oak roof boards we applied on Friday. What a beauty! ( Okay – except for the lawn which I know needs mowing.) Here you can see half the roof boards and I think this shot does the old timber frame justice – look at the potential of this lovely structure! Stay tuned: Next week we will focus on completing the roof boards and installing the rest of the metal roofing. 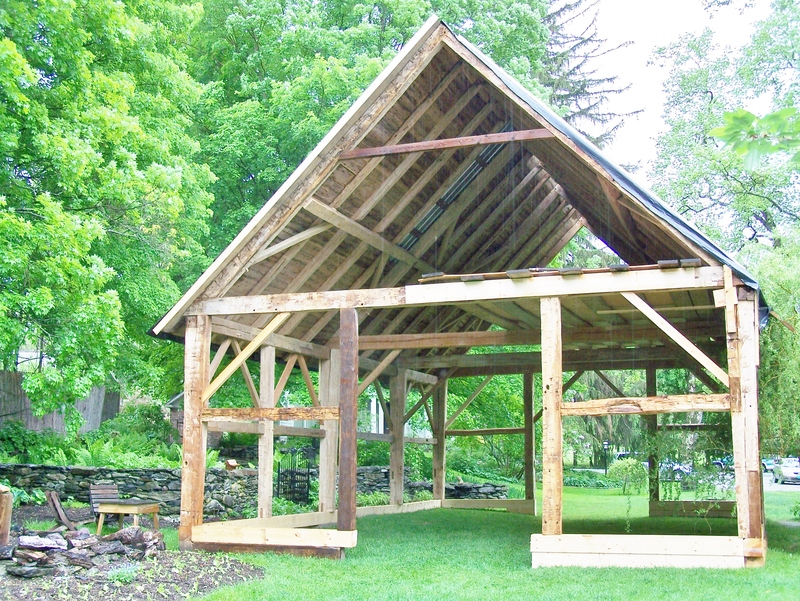 This frame will be fully restored and ready to host summer events here at Sissy’s Kitchen. We’re even planning on using some vintage planks to make three harvest tables with benches, which will sit beneath the restored gunstock timber frame. I have to go now and mow the floor. Guests are coming………………………. 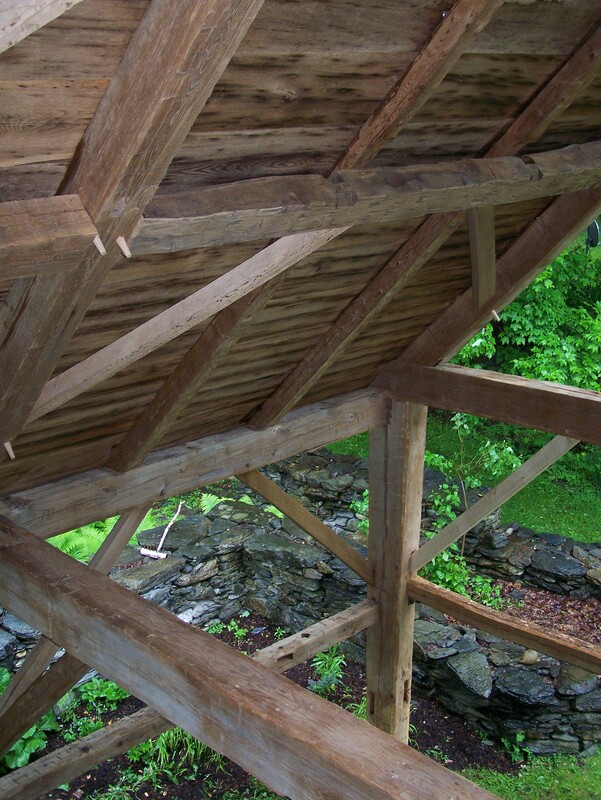 This entry was posted in Frames in stock, Green Mountain Timber Frames, Middletown Springs, Vermont and tagged American heritage, barn frames, barn homes, barn houses, barn restoration, colonial america, custom barn home, Green Mountain Timber Frames, historic properties, restored barn frames, timber framing, vermont timberframe by Green Mountain Timber Frames. Bookmark the permalink. Thanks for your thoughts, Ive chacked quite a few websites but all they seem to say are “it continues well into the 21st century” “still in progress as of 2009” “and continues as of 2010” but im doing this for a very strict teacher so if i get this fact wrong i dont know how my grade’ll turn up so please help!! !